Yes, window wells are made for safety. But, that doesn’t mean it has to look boring! There are many ways to spruce up that hole on the side or back of your home. Your window well will still be functional, it will just look beautiful too! Give your guests something to look out to instead of a metal structure. Make it become eye pleasing instead of an eye sore. When people walk into your basement they will be impressed with the detail you put into your house by giving life to your window well. There are ways to make it look fantastic from the outside and inside of your home, and I am excited to share with you these design ideas in this article! Here at Window Well Experts, we strive to make the safest and the highest quality product out there. But we also have some style! We give you options. Options that give some beauty to your boring window well. We make excellent window well covers. These serve as a maintenance and safety product so that nothing gets into that hole. But these aren’t the regular cheap looking plastic ones you get at the big box stores. These are sleek, modern, and darn good looking! We customize these window well covers and some even have different color options to personalize it to your style. Along with a window well cover, you can build a garden box around the window well! This will instantly give value to your home because of the beautiful landscape this brings. For easier landscape, you have a rock bed around the window well cover. This looks great and is a low maintenance way to do landscaping. Window wells can be as beautiful or even more beautiful on the inside! Again, with us, you have so many design options to choose from. Desire to look at something other than a piece of metal? Maybe you would like to look at a river scene, or maybe the ocean. 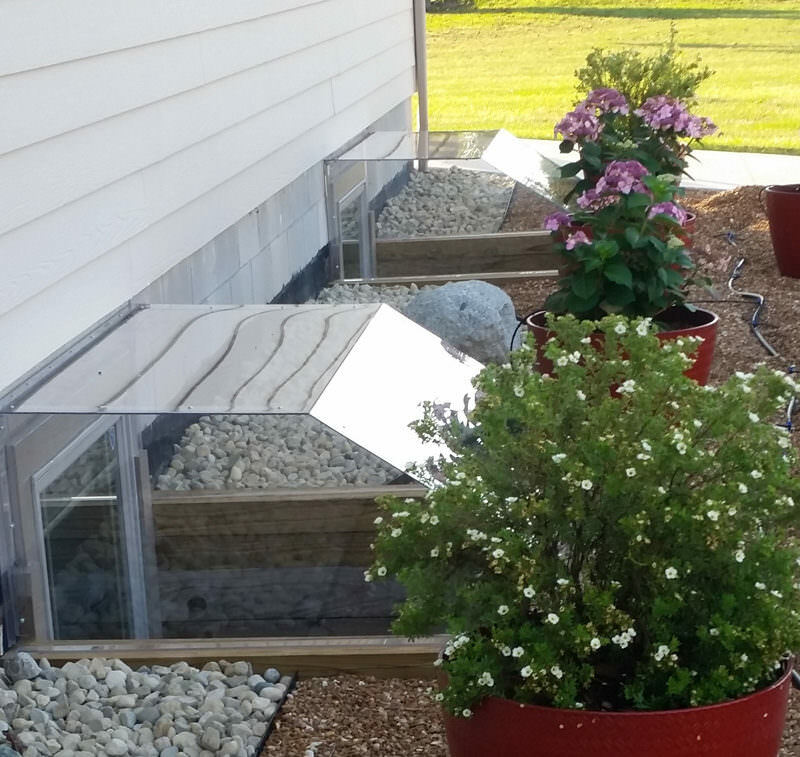 You have these options with our decorative window well liners! Relax in your basement and look out the window to see a gorgeous scene of nature. You can pick from our wide variety of scenes that we have and easily install it! Again, if you don’t want to look at metal you don’t have to! We also offer faux rock window wells and window wells that have garden steps for you to put plants on. The design options don’t stop there. With one of our stunning faux rock window wells, make you own window well garden! Put some rocks at the bottom and bring in some beautiful plants in pots! This gives a warm feeling to your cold basement and also brings in some fresh colors! Turning your window well into something great to look at isn’t so hard! Check out our site to get great ideas on how to give life to your dull window well. You’ll feel better walking down into your basement when this design project is complete!